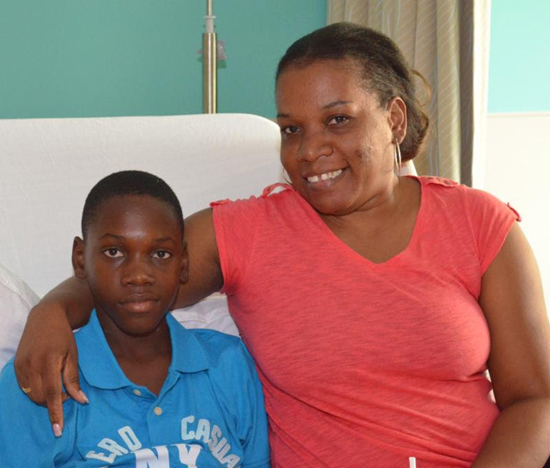 CAYMAN ISLANDS - A relieved mother from St. Kitts and Nevis is grateful for the doctors and staff of Health City Cayman Islands and its partners following the successful cardiac treatment of her son. Shellon McCalmon thanked the Caribbean hospital "for the hospitality you have offered to us. For your patience and time in making me, and my son most of all, safe and well." The patient, 12 year-old Phesaun McCalmon, was treated for an Atrial Septal Defect (ASD), a "hole" in the wall that separates the top two chambers of the heart. ShellonMcCalmon was impressed with Health City's attention to patients and those who accompanied them: "Your kindness, most of all, was very warming and we felt welcome," she said. The Kittitian mother was particularly appreciative because the surgery and hospital stay wereprovided at no cost to her thanks to the collaboration between Caymanian and international charities. "We were very excited to be able to send our first patient to Health City Cayman Islands," said Susan Rickman of World Pediatric Project. "We are also looking forward to a long and successful partnership with Health City as we strive to provide quality healthcare for kids around the world," she added. And, it was special care which Phesaun and his mother will never forget: "From the bottom of our hearts we look forward to meeting with you again, not necessarily because of illness, but to share in yours and our success." "This was my first experience working with Health City Cayman Islands," said referring pediatrician Dr. Ian Jacobs in St. Kitts. "The professional service they provided was excellent, and the support they gave to my patient and his mother was wonderful," he added, noting that the doctors kept him informed with regular updates throughout the process. Health City Cayman Islands, the vision of renowned heart surgeon and humanitarian Dr. Devi Shetty, is supported by two major healthcare organizations, Narayana Health and the U.S.-based Ascension, which is that nation's largest faith-based and nonprofit health system, providing the highest quality care to all with special attention to those who are poor and vulnerable. Health City Cayman Islands provides compassionate, high-quality, affordable healthcare services in a world-class, comfortable, patient-centered environment. Offering healthcare to international, regional and local patients, Health City Cayman Islandsdelivers excellence in adult and pediatric cardiology, cardiac surgery, cardiacelectrophysiology, medical oncology, orthopedics, sports medicine, pediatricendocrinology, neurosurgery, minimally invasive spine surgery and pulmonologyservices.